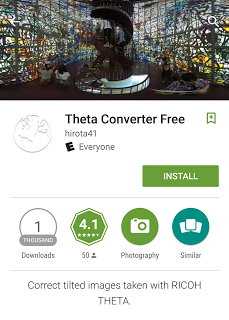 Theta Converter is an Android app that will straighten or realign images from the Ricoh Theta S and inject 360 metadata as well. In this shot, I used the effect intentionally, but for most photos, the effect is not desirable. 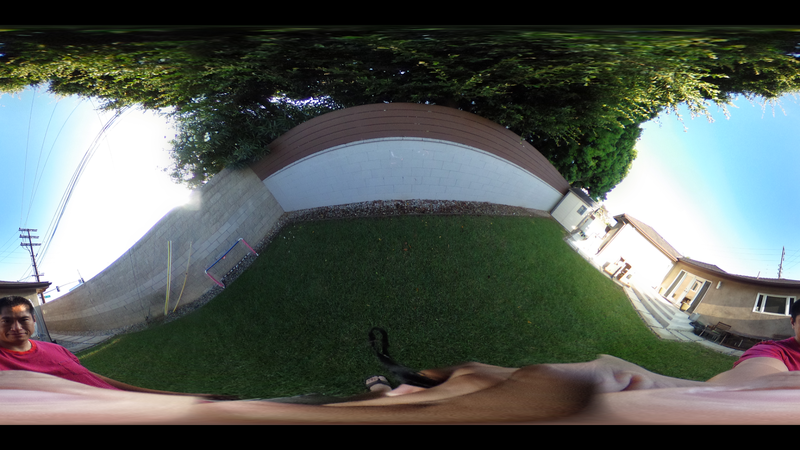 The Ricoh Theta S has a gyroscope to correct the vertical orientation automatically. However, what the Theta does is to record the pitch, roll and yaw data. When the image is opened in the Theta app or desktop software, the app reads the gyroscope data and renders the image correctly. 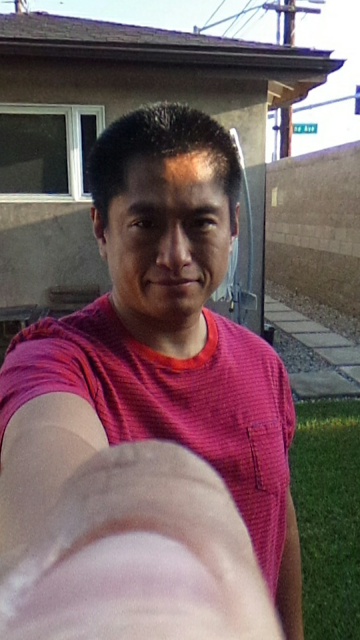 However, when the image is viewed on another viewer, or if the image is edited, the gyroscope data is either not read or lost entirely, resulting in an uncorrected horizon. Theta Converter is an Android app (iOS version here) that saves a new copy of your Theta photo with a corrected horizon. There’s a similar desktop app called Level Theta but Theta Converter adds additional capabilities such as re-orienting the photo or tweaking the horizon alignment. 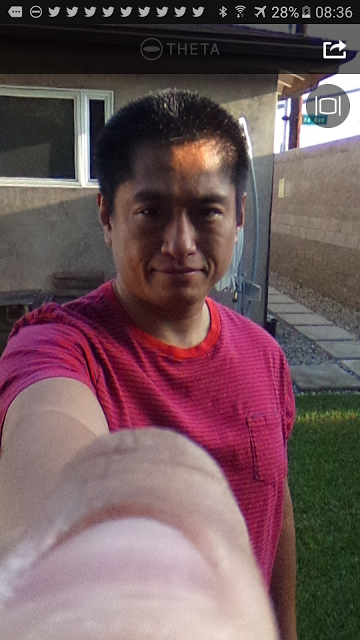 Here’s a sample photo with a tilted horizon. After installing Theta Converter, you use it by going to your phone’s Gallery app, then tap on “share”. One of the options will be Theta Converter. This will show the Theta Converter interface, which will show a corrected horizon. There are also additional controls on the left side to re-orient the photo (I moved myself to the middle, for example), or to tweak the horizon alignment. When you’re done, just tap the check mark on the bottom right, and it will save a corrected copy of the Theta photo, plus it will inject 360 metadata. The correction appears to be lossless. I cannot discern any loss in image quality. 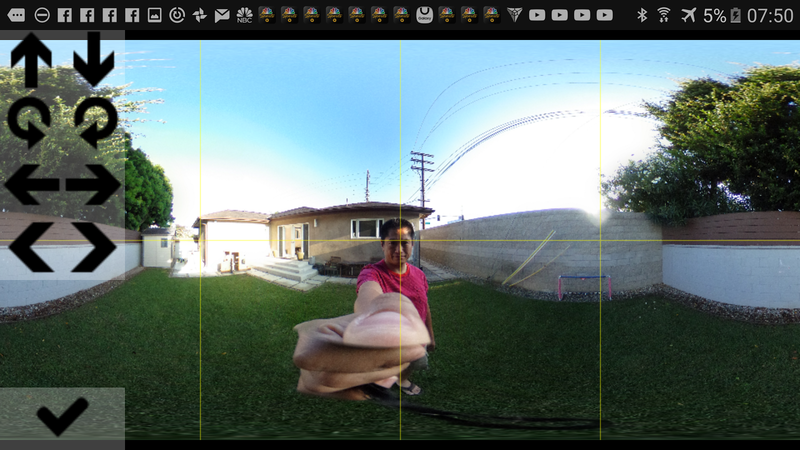 Here is a cropped view from the Ricoh Theta S app, comparing the original Theta image, and the Theta Converter image. 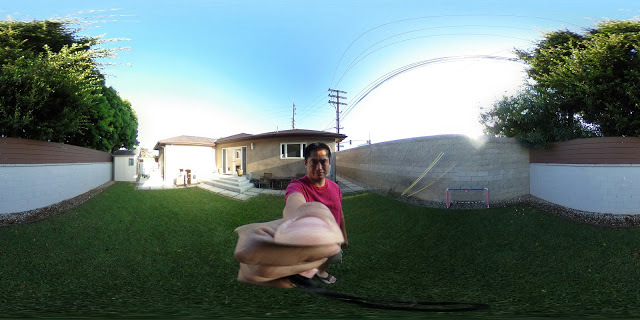 Although the app was designed for the Ricoh Theta, it can also be used to re-orient or realign other 360 images (although the correction won’t be automatic). The developer is working on a version of the app for iOS, although it will probably be a paid app. Update: here is the iOS version.